SPRINT KARTING: Hoosier Racing Tire offers a comprehensive line of dry and wet weather kart tires designed specifically for sprint, autocross, enduro and super kart applications. Hoosier’s high quality products provide drivers of any experience level with a tire that meets their high performance needs. 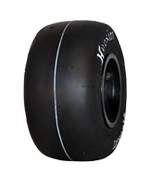 Hoosier‘s diverse product line consists of tires that are suitable for various types of 2-cycle and 4-cycle kart racing. These applications include open competition racing - where ultimate performance is paramount, spec tire racing – which is defined by consistency in performance over multiple sessions, and entry level/economy racing - where a low cost tire that exhibits superior wear characteristics is ideal.